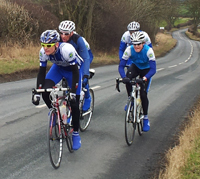 About Ferryhill Wheelers Cycling Club. Ferryhill Wheelers Cycling Club was founded in 1926. The Club has around 100 members aged from 10 to 90, who participate in most cycling disciplines, including road racing, track racing and pottering around the lanes. Mountain High Cycles of Ferryhill supply goods and services to Club members at favourable prices. Various cycling events are organised throughout the year, including Time Trials and Road Races, where members can compete for the large number of trophies held by the club. It is a condition of Membership that members are covered by third party insurance by being a member of one of the following organisations - Cycling UK, British Cycling, or the League of Veteran Racing Cyclists. Or by having Cycling UK affiliate third party insurance through Ferryhill Wheelers or another cycling club. Club meetings take place on the first Monday of every month at 8.00pm in Ferryhill Catholic Club. If the first Monday is a Bank Holiday, the meeting takes place the following week. The Annual General Meeting is held at the same time and venue on the first Monday in December.